Jen's Ink Spot: Catherine Pooler Tropical Treasures New Release + GIVEAWAY! Catherine Pooler Tropical Treasures New Release + GIVEAWAY! Welcome to the blog hop for the new Catherine Pooler Designs Tropical Treasures Release! 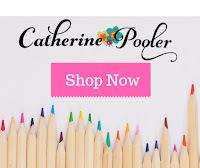 All of the products are NOW AVAILABLE in the Catherine Pooler store! There are some FUN new products available that you're going to want to add to your growing collection! I had so much fun creating with this collection that I had a hard time narrowing down what to share with you today. So, I have a card set with 5 cards and then if you scroll to the very end you'll find one more rainbow inspired hexagon card for a total of 6 cards today. For this first set of cards I was inspired so much by the new Wild Thing Background stamp. I LOVE those wonky polka dots! This card set came along by accident actually. 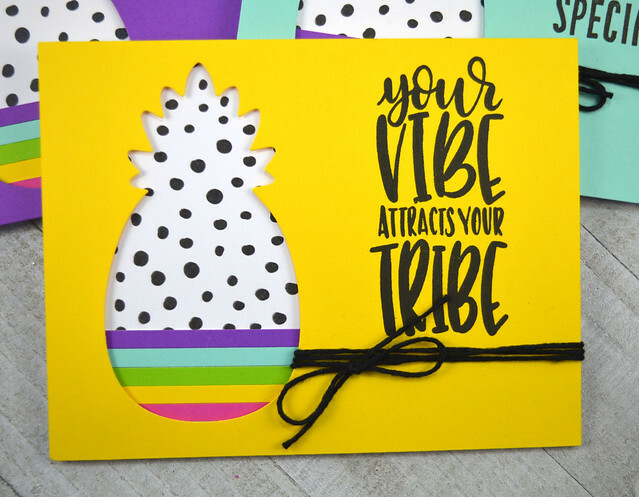 I had die cut a pineapple from the super fun Pineapple & Smiles stamp set and had also stamped out several of the Wild Thing Backgrounds and then laid them on top of each other while I made a different card. 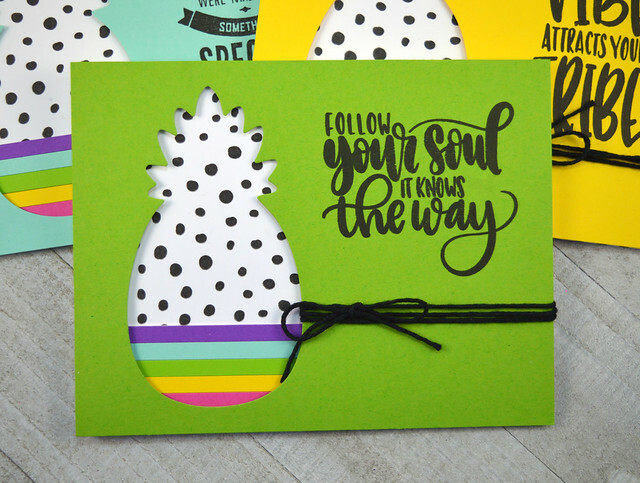 When I looked over and saw those polka dots peeking through the negative of the pineapple die cut image I knew right away I needed to make a card...or two...or five. And because of that this card set was born. And I believe it is my favorite thing that I made for this new release! So to start each card I die cut out the pineapple from 1/2 of the card front using the Pineapple & Bits dies. I then stamped out the Wild Thing Backgrounds 5 times on Premium White cardstock using my Misti which made it go very quickly. 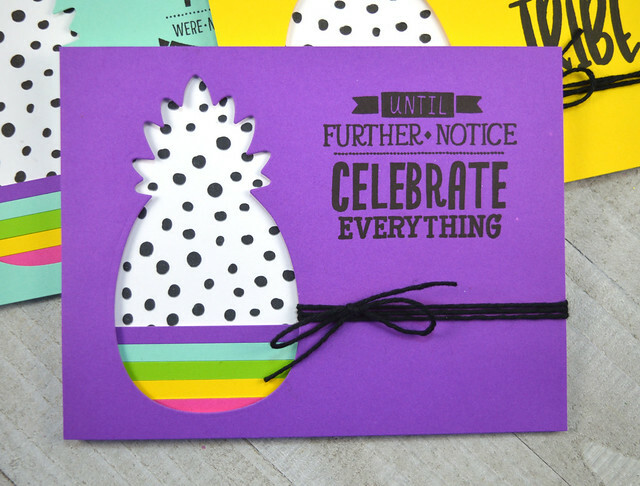 I used a sliver of cardstock from each color and made a rainbow at the bottom of each pineapple that is peeking out. I stamped the various sentiments on the card front, wrapped black twine around each colored piece and then attached the colored cardstock with dimensional tape to the Wild Thing polka dotted background. Below is a closeup of each card (I'll list the sentiment that I used underneath each one). This last card was inspired by quilting. No, I don't quilt but I LOVE quilts and the patterns that you can find on quilts. There are a lot of quilts that use hexagons in the patterns and that is where the inspiration for this card was found. For this card I started by stamping the black & white center of the flowers on Premium White Cardstock using the Hex Marks the Spot stamp set. I chose two ink colors for each flower (colors linked below) and rotated colors as I went around the center. I decided to use the solid hexagon for the petals but there are lots of fun patterned stamps so that you could easily use the solid hexagon for the center and use some of the patterned hexagons for the petals! That would look super cool too! The sentiment is stamped & embossed on vellum and is from the Say it in Diamonds stamp set that was previously released. Here's a closeup of the flowers. Once I finished stamping all of the flowers, I added the trio of polka dots using a tiny stamp in the Fearless Pursuit stamp set just to fill in some of the gaps and add more visual interest. I cut the panel down slightly and adhered it to a Midnight card panel. Be sure to come back tomorrow on my blog as I'll be sharing another card made with products from the new release (not shown here)! 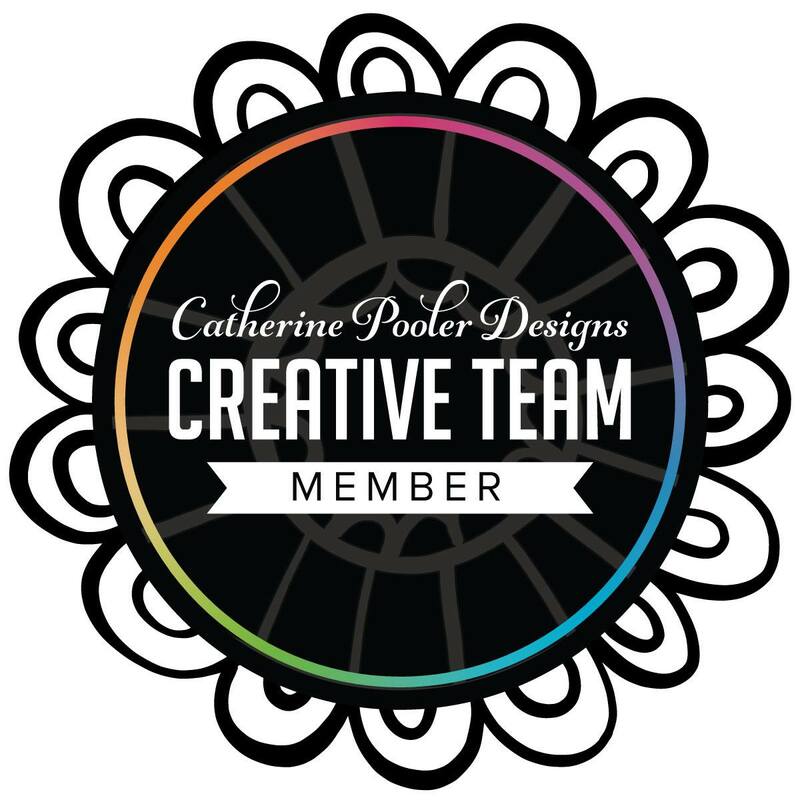 Comment on my blog post for your chance to win a $25 Gift Certificate to the Catherine Pooler store (and you can use your gift certificate for ink too!)! Wow! 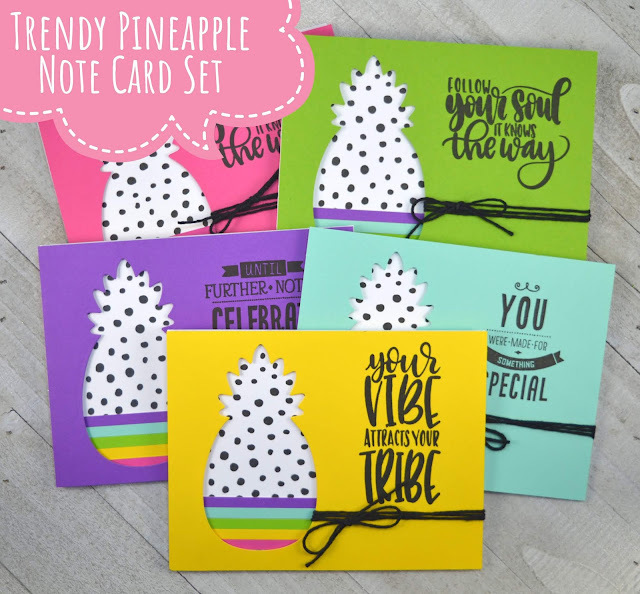 Love your note cards using the pineapple die set and the colour card stock is awesome everyone should have this in their stash. Thanks for sharing your amazing cards, love them. 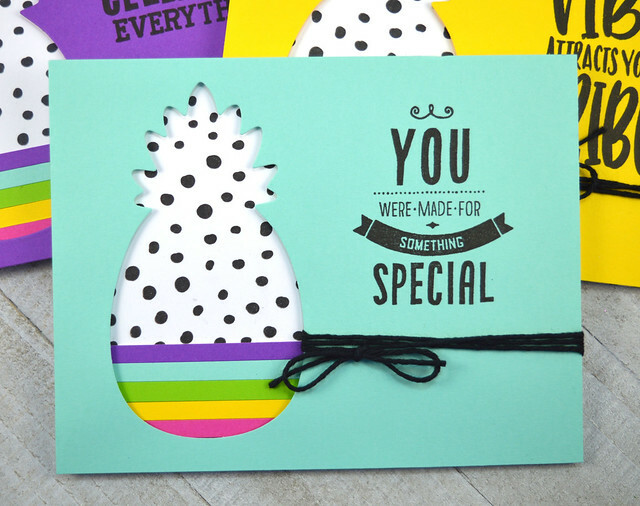 The note cards are so cool, I love the pineapple cut out with a bit of rainbow showing. The quilt pattern on the other one is gorgeous. Your hexagon card is my favorite! Great ideas and super cards, Jen. So bright and cheerful. The hexagon flowers are ingenious! I recently found your facebook page and I Love it. I downloaded your color guide...and soon will be investing on your ink. I am very excited! beautiful work! I love the pineapple note cards! They are so cute and the colors are so springy! Love how you made the flowers with the hexagon stamps. Thanks for sharing! your Hex Marks the Spot flower power card looks like a beautiful and colorful quilt! LOVE this Card! Cute set of notecards. Love the hexagon flowers! Love the pineapple die cut. Love the card set and the hexagon card is lovely! Loves these note cards. Your hexagon flowers are adorable. I love your cards! I'm pretty sure that pineapple is my favorite stamp from this collection! What a clever idea! Love your pineapple card set! Simple and elegant! All your cards are very pretty and colorful. Oh my goodness, I didn't think I needed that spotty background... but now I think I do. Gorgeous cards! Wow! I am no longer on the fence on the hex marks the spot stamp set! your quilting is gorgeous and now I NEED those stamps. Very nice! So many wonderful cards. Love all the awesome colors. Oh wow, these are so fun - love the vibrant colours you used! 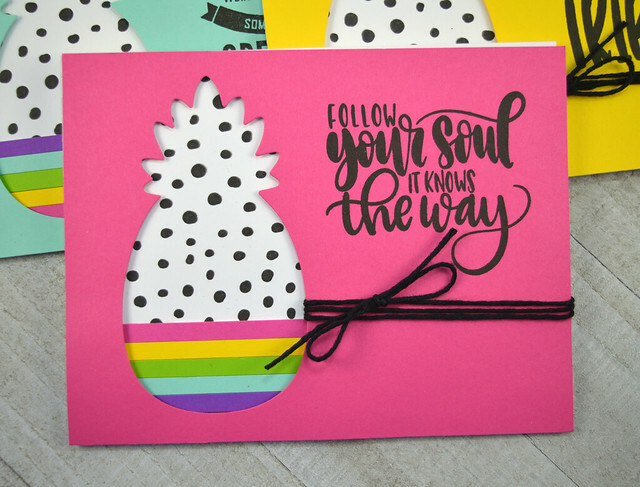 Cute and colorful set of pineapple cards and love the colorful hexagons too. AHHHHH SO FUN! I love the pineapples! I love the bright colors!!! What a great note set! What a way to show off those awesome sentiments! Pretty colorful cards. Love the pineapple! So cool. I know several young people who would love to get cards like these. I know they would think they are pretty cool too. NICE ! These are awesome! Love the pineapple cards, and the hex designs are awesome! Great colors! Your cards are so pretty and cool! 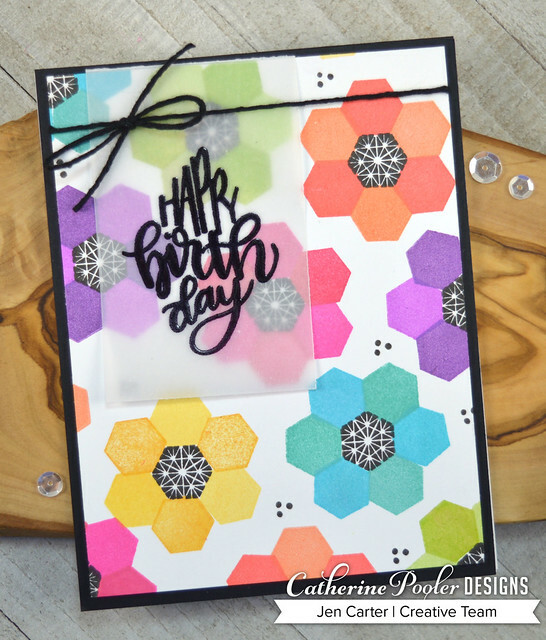 Love the hexagon birthday card. Those polka dots are truly awesome! And I LOVE you hexagon card!! I really love your pineapple cards, Jen! So fun and perfect. The Hexagon one is amazing as well!!! I love your pineapple cards!! What a clever idea!! The Hexagon card is fabulous!! Such unique ideas. I love the pineapples!!! Beautiful cards, beautiful colors. I don't quilt either, but I've always loved the geometric patterns on quilts, and your sample is wonderful. Love the bright colors you used on the cards. I need to get the Hex Marks the Spot stamp set. Wow! What an amazing card collection you crafted! I love how you used the negative space of the pineapple! Very cute! I absolutely LOVE the pineapple cards! Such a fabulous design! I always love your style. All of your cards are fantastic! Such fun cards! These colors are just perfect! I adore all the pineapple's! 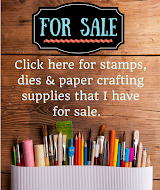 It would make a great gift for a non crafty friend/family. The hexagons are stunning! I too have been an admirer of quilts since I was a child. Making them look like flowers - so smart - & very beautiful! What fun cards, so fun and festive! Love this card set especially the hexagon card!! I really love the hexagon card. The card set is so much fun. I enjoy seeing a card design done in different colors. Such fun cards. 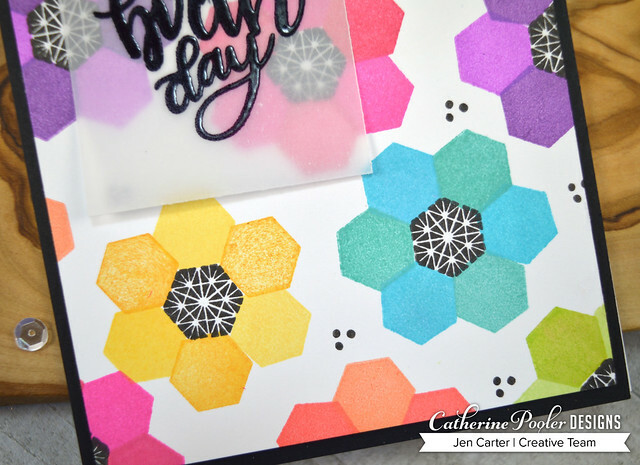 Love how you used the hexagon stamps. 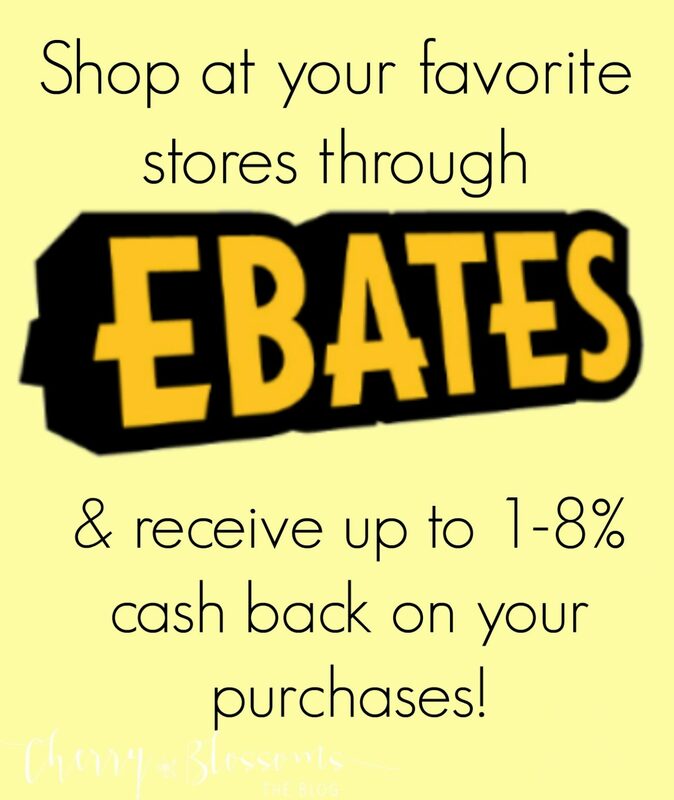 Big 24 Hour FLASH Sale!